A quick family favorite dinner recipe that kids will eat and love! Easy DIY recipe Tutorial Idea. Cook and drain the ground beef in a large skillet. Cook and drain the egg noodles in a medium pot. Preheat the oven to 350 degrees. In a large 9×13 baking dish, start by spreading a thin layer of the pizza sauce on the bottom of the baking dish. Continue by layering in this order: Half of the noodles, half of the ground beef, half of the pizza sauce, half of the shredded cheese, the remaining half of the noodles, the remaining half of the ground beef, the remaining half of the pizza sauce, the remaining half of the cheese, and top off with the pepperoni. If you are using any optional items, incorporate them into the layers of ingredients. Cover with foil and bake for 20 minutes. After this time is up, remove the foil cover and bake for another 15 minutes. 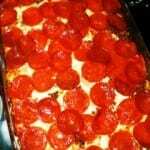 Allow the pizza casserole to sit for about 10 minutes before serving.